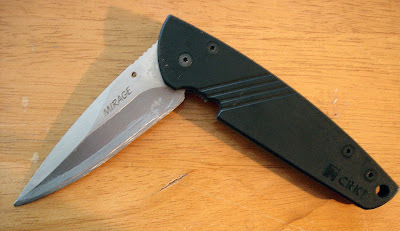 I carry (only when I'm hunting of course) this CRKT knife which I got for a few quid (about £8 as I recall, second-hand) from Ebay. It soon lost its little widget that enables you to move the blade from closed to locked open with your thumb, but this is no great loss since the blade is so wide at the top and so heavy that a flick of the wrist is all that is required to get it to open and lock (though this is not a manoeuvre to practise whilst walking to one's shooting ground). This is actually rather handy when you have a recently-shot rabbit by the front legs, one that you have squeezed - so as to expel its pee - and are now about to gut in the field. I'm not about to go buying new knives since I'm skint, but if I was, I'd probably - now that I've actually had to gut a few rabbits - go for one with what's called a gut-hook on the blade. This is a little hook-shaped blade which allows you to - essentially - unzip a rabbit's stomach from ribcage to pelvis without running the risk of slicing through any of its guts at the same time. This being something that's best avoided if you want to eat the rabbit because the guts may taint the meat. Doing this with a conventional knife in a dark field with cold-weather-numbed hands is not that easy, I've learned. Keeping the knife sharp is also important, I discover: blunt knives - to my amazement - don't cut very well. I've found no alternative than to use a proper oil-stone & oil, and then grind alternate sides of the blade at a 20-degree angle - stropping on a leather belt to finish and polish the cutting edge. Even my cack-handed and impatient fettling skills can produce a fairly sharp knife with this method. The Mirage is heavy enough - just about - to serve as a field meat cleaver: a few blows on a fence post will remove the head, feet & tail of a rabbit - leaving you with just the job of getting the rabbit out of its skin when you get home.